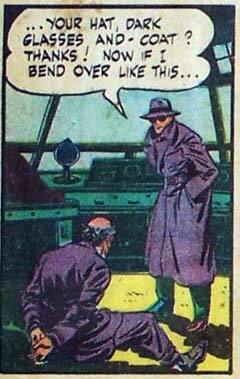 “…your hat, dark glasses and – coat?” makes it sound like he’s not sure if he’s got the man’s coat or not. Maybe he wants to use a less general word, but isn’t sure if the coat’s a duster, a trenchcoat, or a mac, and doesn’t want to sound like an idiot. If so…too late! Great, now I have to hit Wikipedia to learn the differences between a duster, a trenchcoat, and a mac! Wouldn’t want to sound unsure like this guy here.